I read this particular book based upon John's review. I think the review is more interesting than the book was, which is why I read John's blog. My relief in finding this book is not based solely on the general contributions of you and your wife to the scientific study of the paranormal. Your wife also positively invites correspondence dealing with anomalous phenomena to be sent to the mailing address set out above. 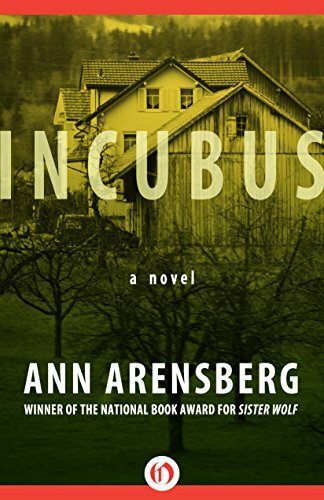 That makes two strokes of luck, since "Incubus" contains the first mention I have ever encountered in print of a phenomenon that, I believe, represents a serious threat to public safety. Before turning to that matter, however, please let me make a few comments about your wife's tale of what happened when a peaceful New England farming community was struck with an infestation of sexual demons. To begin with, the term "sexual demons" may make this book sound randier than it actually is. The female characters are, for the most part, respectable middle-aged women who do nothing out of character. Some of the descriptions in the book are appallingly gynecological. However, even the most flagrant paranormal outrages, which occur at the local girls' academy, are described in a medical way. The plot is based on nothing more provocative than a sexual dry-spell in the marriages of the local matrons. The situation is mysterious only because it is collective. Until late in the book, the manifestations of the supernatural are not readily distinguishable from ordinary phenomena familiar from dream-research: dreams of being awake but paralyzed, and a feeling of pressure on the body associated with dreams involving sexual content. The latter is nearly all an "incubus" was supposed to be. In the High Middle Ages, educated people thought that these incubi were almost certainly purely psychological, so women who complained of incubi to their confessors were not given severe penances. Later in the Middle Ages, of course, these incubi (and their female counterparts, succubi) were believed to have an independent existence. The people who reported dreams involving these creatures were therefore suspected of actively consorting with demons. This provided the gravamen for witchcraft trials, and all Hell duly broke loose. "Just as human beings long for union with the spirit, so incorporeal beings, both angels and demons, yearned for contact with matter. Angels contented themselves with exerting a benign influence over men's bodies -- snatching them out of the path of a boulder during an avalanche, guiding the surgeon's hand during a long and difficult operation -- but demons had no such ability to hold their natures in check. Their desire to be familiar with flesh was ravenous, insatiable, the more urgent because they possessed no generative powers." This is, by the way, one explanation for why God, who normally seems willing enough to put up with quite a lot of human delinquency, took the trouble to destroy the early world. Something radically wrong had entered into the human race, something that went beyond mere misbehavior. This notion has found favor with some modern apocalyptic groups who are also interested in flying saucers. The flying saucers, it seems, are not piloted by extraterrestrials, but by demons pretending to be extraterrestrials. Once again, they are interfering with human history, which is part of the reason why, once again, human history needs to be ended. Some of this does not even make for very good science fiction. On the other hand, the idea that a lot of the physical world is driven by self-organizing "principles" has been given a boost in recent years by chaos and complexity theory. Mathematical entities can behave in ways that are uncannily reminiscent of biological entities. Indeed, the former are now sometimes being adduced as the causes for the latter. As several books have noted recently, there is so much information in the genetics of even the simplest organism that it is hard to see how life could have appeared on Earth as quickly as it did, practically as soon as the surface ceased to be molten. It is almost as it the information were an accident looking for a place to happen. "[I]t is far from obvious how there can be a concept of information without a context that makes it useful or meaningful. The information coded in the DNA of a cell is about how the cell can best survive. Such information could not have existed before there was a biosphere, for the same reason there could not have been gossip before there were human beings. In any case, Davies is not the only physicist who seems to believe that information has an objective meaning independent of context, and I am not the only one who cannot understand what that could be." Perhaps there is nothing to be added to these observations, except to note that atoms are pretty complicated critters, too, and they seem to have appeared with the spontaneity of snowflakes on a cold day. In any case, the point of this discussion is not to argue for the existence of demons, or at any rate for the would-be anthropomorphic demons in this novel. I am simply suggesting that the existence of non-material entities that can nevertheless affect matter is plausible enough to raise supernatural fiction from the realm of pure fantasy to that of unfounded speculation, as in science fiction. "But every woman praying or prophesying with her head uncovered disgraces her head....For man was not created for woman, but woman for man. This is why the woman ought to have a sign of authority over her head, because of the angels." [1 Cor. 11: 5, 8 - 10]. Conventional exegesis holds that "the angels" mentioned in this passage were simply a rhetorical device. Cora's own experience suggests that these words are a safety measure to protect the congregation against dangers that are far more than rhetorical. However, while this might induce her to take some passages of scripture more literally, the encounter with he uncanny does not have the effect of reinforcing the Christian faith of anyone involved, including that of her priest-husband. The problem is that they are encountering the supernatural in its raw, undiluted form. Presumably, people in ancient times encountered it, too, and created religions to deal with it. "Incubus" suggests that modern people, lacking either the will or the poetic imagination to perform another such work of synthesis, are likely to see their traditional faiths corrode under an onslaught from the other world. "At a service in a crowded church I felt estranged, unconnected. In an empty church I experienced a sense of relaxation and a quickening of the spirit, as if the curtain were about to go up in a dimming theater. It was a friendly little building, well worn but well kept, hymnals faded and loose at the spine, brasses gleaming and altar linen spotless. Something resided in this vaulted space, however mankind had misportrayed it." No more spiritual perception than this has gotten many an ordinary parishioner through a lifetime of church-going. Actually, the idea that churches should be so designed as to invite visits, even when a congregation is not present, is an idea to which modern church architects are finally returning. Nevertheless, such a "religion" is small support in times of trouble, even of trouble less taxing to the spirit than an invasion of summer demons. Just as important, intuition is a pale substitute for inspiration. It is hard to imagine anyone being inspired to write notable music for a Mass dedicated to "The Historically Misrepresented Something in the Vaulted Space." It is also hard to see why the corporal works of mercy done by church members should not be turned over to social workers and, eventually, to the police. In any case, these points do not represent flaws in the novel: they are just questions that it raises for me. The book is as congenial as the Church of St. Andrew and, one suspects, a prime candidate for being turned into a television screenplay. The logical way to organize the story would be through the investigation conducted at the behest of the air-head Social Gospel bishop after the incident is over. An Episcopalian Inquisitor: surely that would be a novelty even among paranormal phenomena. This brings us, Reverend Lieber, to the reason for my letter. At one point during the summer of 1974, the book says that you noticed certain new maintenance problems with the rectory. Cracks appeared in the basement floor, soot was dislodged down the chimney and a great proliferation of mole-hills sprang up in the backyard. When you drew all these facts together, you deduced that there was a general pattern of attempts to invade the house. Cora, perceptibly, suggested that the invaders were probably were-moles, but you unwisely dismissed this suggestion as sarcasm. Think again, I tell you. I know for a fact that there are were-moles, and that they are actively undermining civilization as we know it.